It's Here! Arriving to the store today is this much anticipated game from Queen Games. It is the hottest game coming out of this year's Essen Game Trade Show. 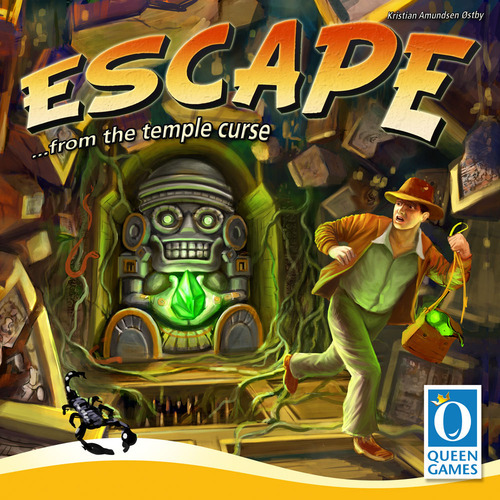 Escape... the Curse of the Temple is a real-time board game. It's an action-packed mad dash through the temple in an effort to activate the magical gems in the temple chambers before time runs out and the temple collapses. Instead of playing the game in rounds, each player rolls their five dice as quickly and as often as they can without waiting for their teammates. You only have 10 minutes to activate all the gems and escape from the collapsing temple, so don't dawdle. Watch out, though, as twice during the game a gong will sound throughout the temple heralding a count-down. All must then hurry back to the starting chamber as only this location is guaranteed to be safe. Fail to make it back in time, and you lose one of your precious dice. Be sure to coordinate your actions and look out for another as some tasks can be completed only collectively. What's more, even if only one player fails to escape the temple in time, all of you have lost the game. The countdown to total destruction is provided by either a sand timer or a CD soundtrack, both of which are included in the game box. We have played this game and find it a blast. Keeping your dice on the table can be challenging because you are rolling them as fast as you can.